Nebraska Dept. 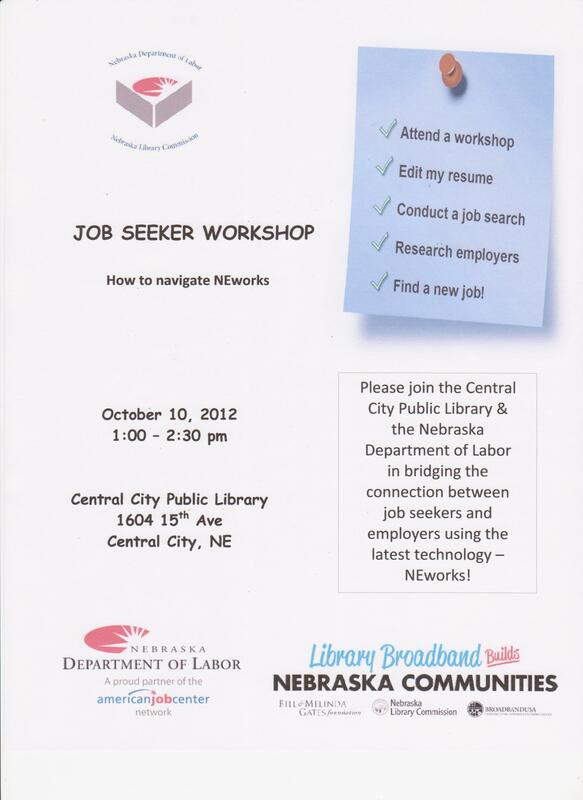 of Labor to Conduct Job Seeker & Employer Workshops at Library! Please join the library and the Nebraska Dept. of Labor in bridging the connection between the job seekers and employers using the latest technology- NE works! Edit your resume, conduct a job search, research employers, and find a new job. Stop by anytime between 1:00-2:30 p.m. Wednesday, October 10th. Employers are invited to join us anytime between 10:30 a.m.-noon that same day, for an Employers Workshop. Employers can learn how to: Navigate NEworks, post jobs, search online resumes, attract quality candidates, and find and use labor market information. FREE Computer classes will be offered at the library in October (coordinated by Central Community College-Columbus). *How/Where do you save your files and how do you find them? Learn how to save your files and how to open them back up to view or change them. Students will gain the skills to be able to add (upload) pictures to a website (Facebook, Ebay, Email, etc). * How do you compose a letter on the computer? lowercase, bold, italicize, underline and change color) to make your letter personal using Microsoft Word. * What is the Internet and how do you use it? Learn the basic terminology and screen layout. Learn how to search for information, and how to maneuver through a web site. Saturday, October 6, 1-3 p.m.
navigating the site. In this class you will learn how to sell an item on ebay. “CRICUT EXPRESSION” MACHINE AVAILABLE FOR PUBLIC USE! The last session for the “Weekly Computer Fun Class” will be held on Wednesday, February 29th from 2:00-3:00 p.m. in the library meeting room. The topic for this class will be “eReaders”. Anyone is welcome to attend this free class. Be sure to bring your eReader along with and your laptop (if necessary for downloading with the type of eReader you have). We will be available to answer questions about how the “Nebraska Overdrive” system works. This system allows library patrons to checkout eBooks and audiobooks, using their eReaders. As of February 10, 2012 eBooks that are published by Penguin (loaned for reading on Kindle devices) will need to be downloaded to a computer and then transferred to the device over USB. New Color Laser Printer and Scanner at the Library!